Jackie is very excited to become a sidekick. Her mother doesn’t seem to share her enthusiasm. Really Miss Melee needs to be gentle on this. And maybe taking the mask off may be a good thing. … I think Jackie is in for a spanking, judging by the look on her mother’s face right now. Now how will she say “You are SO grounded, young lady! Grounded for LIFE!” without giving away her own identity? …Of course, the question with -that- approach is whether or not the tone of voice gives it away. Jackie attempting the Christian Bale Batman voice is the most adorable thing I’ve ever imagined. 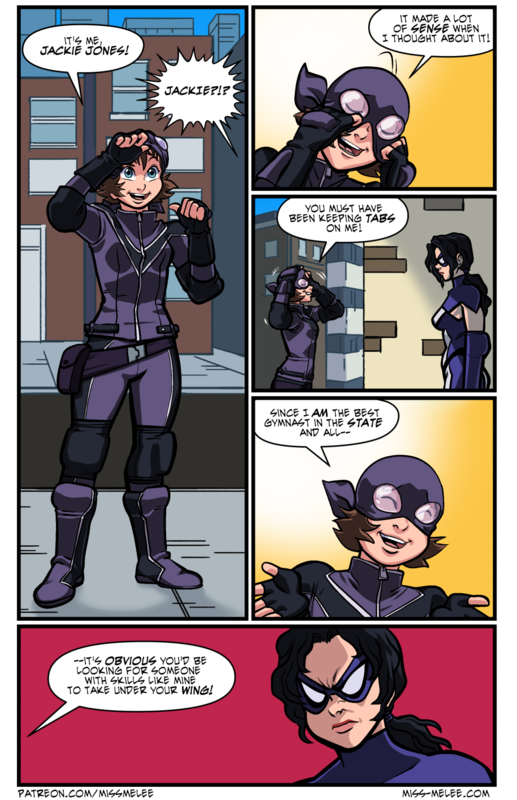 The only way that she can spin this without causing a fight is for Miss Melee to point out that she had years of training before she put on a costume and went out to fight crime and that she did not intend for Jackie to jump into this half cocked. Ok just guessing but i see DOOM training in Jackie’s future. There is no faster way to scare a kid of the way of the warrior then having them run around the neighborhood dragging a tire that their master is riding while brandishing a whip. Also I think that said Doom training will not scare her off. Welllll, I did not expect her to outright admit who she was. But this saves a lot of time from, WILL SHE FIND OUT HER DAUGHTER IS FOLLOWING IN HER FOOTSTEPS?!?!?!!! This presents a really interesting situation. We don’t know how Janice was raised so we don’t know how she’ll react to this. Its possible that she might attack Jackie to show that she doesn’t have what it takes. But I feel that someone or something is going to happen to make them work together. Hastily-improvised cover story backfiring? What are the chances of that happening?